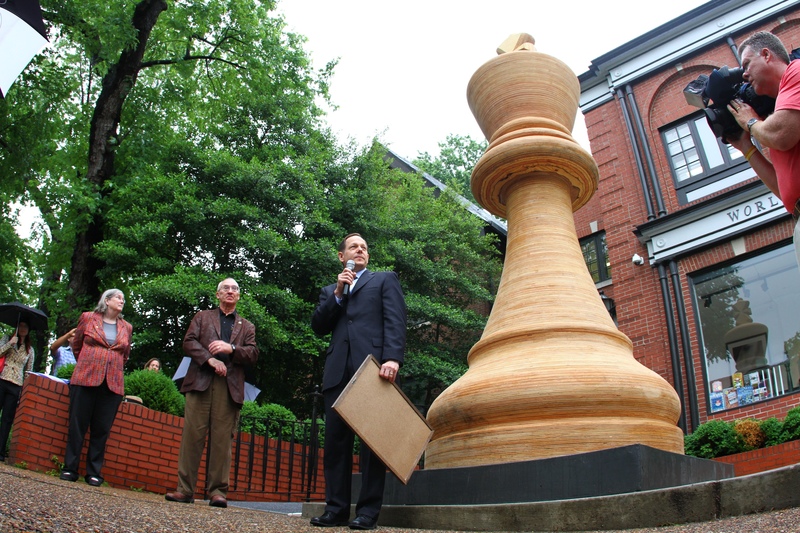 Chess Club founder Rex Sinquefield looks on as Saint Louis Mayor Francis Slay declares May 7, 2012 "Gateway to Chess Day" in Saint Louis. More than 70 students from Saint Louis language Immersion School took a field trip to the Chess Club and Hall of Fame to witness the unveiling of the world record and to tour both facilities. The students got the opportunity to play some of the competitors from the U.S. Championships. Throughout the day, competitors from both events visited area schools to put on simul exhibitions and to speak to students about the benefits of chess. At the opening ceremony, Sinquefield also explained that local Lindenwood University would begin its chess program in the fall, which will include numerous scholarships for promising players and will be coached by the club's Grandmaster-in-Residence Ben Finegold. “We will have a lot of grandmasters living in Saint Louis,” Sinquefield said, also referencing the chess team about to begin at Webster University.